HUNDREDS of refugees are feared to have drowned in the Mediterranean Sea after their boats capsized. Italy's President, Sergio Mattarella, said there seemed to have been "yet another tragedy in the Mediterranean". His comments followed a report by BBC Arabic quoting the Somali ambassador to Europe that 400 people had died crossing from Egypt to Europe. Reports said the refugees were fleeing to Italy from Somalia, Ethiopia and Eritrea in four boats which were ill-equipped for the journey. "2016, the Mediterranean is a mass grave," Médecins Sans Frontières (MSF) tweeted in response to the news. The original flurry of reports have, however, yet to be confirmed by either Egyptian or Greek officials. The Italian coastguard has also said it knew nothing about the reported disaster. Médecins Sans Frontières has also been unable to confirm to The Independent whether the tragedy has taken place. 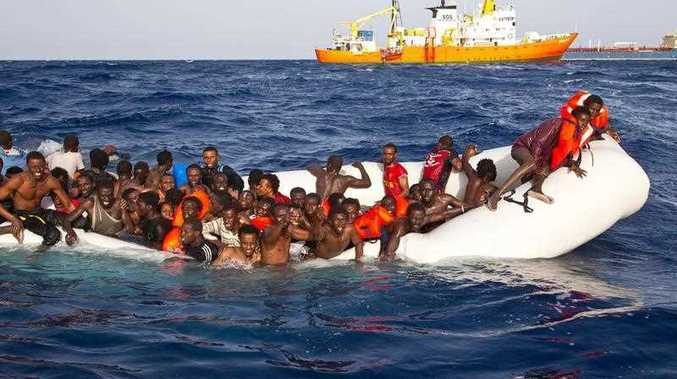 Earlier on Monday morning, the Italian coastguard said 108 refugees had been saved and six bodies recovered from a semi-submerged rubber dinghy on Sunday. Separately, 33 refugees were rescued overnight off eastern coast of Sicily. A year ago, a fishing boat crowded with refugees sank in the Mediterranean with around 800 people trapped inside. Italy has now vowed to raise the shipwreck from the sea floor, to recover the corpses. Almost 6,000 refugees sailed from Libya to Italy last week, in what appears to be the beginning of a wave of 100,000, the International Organisation for Migration said. EU policymakers have been criticised of "killing by neglect" after they cut rescue missions in the Mediterranean. The scaling back of search and rescue operations "created the conditions that led to massive loss of life," according to a report. Tanya Steele, CEO of Save the Children, said: "The lack of concrete measures to protect children who gamble and lose their lives to reach the perceived safety of Europe should weigh on all our minds. A year on from one of the greatest migration tragedies in the Mediterranean, safe and legal routes have not been properly implemented. "Europe continues to see this migration crisis as primarily about safeguarding its own borders. A third of those desperate enough to make this perilous journey are children. Even though the European Commission has identified children as one of the most vulnerable groups, recommending relocation measures as a priority, in effect, this is only happening on paper. "This gruesome anniversary must not be purely symbolic. It is an insult to the thousands of men, women and children who have drowned on Europe's shores if action is not urgently taken to prevent the further loss of human lives. Europe's leaders must invest in search and rescue at sea and offer safe and dignified means of applying for asylum, in line with its legal obligations."